American statesman and parliamentarian, was born, of Scottish-Irish descent, in Abbeville District, South Carolina, on the 18th of March 1782. His father, Patrick Calhoun, is said to have been born in Donegal, North Ireland, but to have left Ireland when a mere child. The family seems to have emigrated first to Pennsylvania, whence they removed, after Braddock's defeat, to Western Virginia. From Virginia they removed in 1756 to South Carolina and settled on Long Cane Creek, in Granville (now Abbeville) county. Patrick Calhoun attained some prominence in the colony, serving in the colonial legislature, and afterwards in the state legislature, and taking part in the War of Independence. In 1770 he had married Martha Caldwell, the daughter of another Scottish-Irish settler. The opportunities for obtaining a liberal education in the remote districts of South Carolina at that time were scanty. Fortunately, young Calhoun had the opportunity, although late, of studying under his brother-in-law, the Rev. Moses Waddell (1770-1840), a Presbyterian minister, who afterwards, from 1819 to 1829, was president of the University of Georgia. In 1802 Calhoun entered the junior class in Yale College, and graduated with distinction in 1804. He then studied first at the famous law school in Litchfield, Conn., and afterwards in a law office in Charleston, S.C., and in 1807 was admitted to the bar. He began practice in his native Abbeville District, and soon took a leading place in his profession. In 1808 and 1809 he was a member of the South Carolina legislature, and from 1811 to 1817 was a member of the national House of Representatives. When he entered the latter body the strained relations between Great Britain and the United States formed the most important question for the deliberation of Congress. Henry Clay, the Speaker of the House, being eager for war and knowing Calhoun's hostility to Great Britain, gave him the second place on the committee of foreign affairs, of which he soon became the actual head. In less than three weeks the committee reported resolutions, evidently written by Calhoun, recommending preparations for a struggle with Great Britain; and in the following June Calhoun submitted a second report urging a formal declaration of war. Both sets of resolutions the House adopted. Clay and Calhoun did more, probably, than any other two men in Congress to force the reluctant president into beginning hostilities. In 1816 Calhoun delivered in favor of a protective tariff a speech that was ever after held up by his opponents as evidence of his inconsistency in the tariff controversy. The embargo and the war had crippled American commerce, but had stimulated manufactures. With the end of the Napoleonic wars in Europe the industries of the old world revived, and Americans began to feel their competition. In the consequent distress in the new industrial centers there arose a cry for protection. Calhoun, believing that there was a natural tendency in the United States towards the development of manufactures, supported the Tariff Bill of 1816, which laid on certain foreign commodities duties higher than were necessary for the purposes of revenue. He believed that the South would share in the general industrial development, not having perceived as yet that slavery was an insuperable obstacle. His opposition to protection in later years resulted from an honest change of convictions. He always denied that in supporting this bill he had been inconsistent, and insisted that it was one for revenue. From 1817 to 1825 Calhoun was secretary of war under President Monroe. To him is due the fostering and the reformation of the National Military Academy at West Point, which he found in disorder, but left in a most efficient state. Calhoun was Vice President of the United States from 1825 to 1832, during the administration of John Quincy Adams, and during most of the first administration of Andrew Jackson. This period was for Calhoun a time of reflection. His faith in a strong nationalistic policy was gradually undermined, and he finally became the foremost champion of particularism and the recognized leader of what is generally known as the "States Rights" or "Strict Construction" party. In 1824 there was a very large increase in protective duties. In 1828 a still higher tariff act, the so-called "Bill of Abominations", was passed, avowedly for the purpose of protection. The passage of these acts caused great discontent, especially among the Southern states, which were strictly agricultural. They felt that the great burden of this increased tariff fell on them, as they consumed, but did not produce, manufactured articles. Under such conditions the Southern states questioned the constitutionality of the imposition. Calhoun himself now perceived that the North and the South represented diverse tendencies. The North was outstripping the South in population and wealth, and already by the tariff acts was, as he believed, selfishly levying taxes for its sole benefit. The minority must, he insisted, be protected from "the tyranny of the majority." his first important political essay, "The South Carolina Exposition", prepared by him in the summer of 1828, he showed how this should be done. To him it was clear that the Federal Constitution was a limited instrument, by which the sovereign states had delegated to the Federal government certain general powers. The states could not, without violating the constitutional compact, interfere with the activities of the Federal government so long as the government confined itself to its proper sphere; but the attempt of Congress, or any other department of the Federal government, to exercise any power which might alter the nature of the instrument would be an act of usurpation. The right of judging such an infraction belonged to the state, being an attribute of sovereignty of which the state could not be deprived without being reduced to a wholly subordinate condition. As a remedy for such a breach of compact the state might resort to nullification, or, as a last resort, to secession from the Union. Such doctrines were not original with Calhoun, but had been held in various parts of the Union from time to time. It remained for him, however, to submit them to a rigid analysis and reduce them to a logical form. Meantime the friendship between Calhoun and Jackson had come to an end. While a member of President Monroe's cabinet, Calhoun had favored the reprimanding of General Jackson for his high-handed course in Florida in 1818, during the first Seminole War. In 1831 W. H. Crawford, who had been a member of this cabinet, desiring to ruin Calhoun politically by turning Jackson's hostility against him, revealed to Jackson what had taken place thirteen years before. Jackson could brook no criticism from one whom he had considered a friend; Calhoun, moreover, angered the president still further by his evident sanction of the social proscription of Margaret O'Neill Eaton; the political views of the two men, furthermore, were becoming more and more divergent, and the rupture between the two became complete. The failure of the Jackson administration to reduce the Tariff of 1828 drew from Calhoun his "Address to the People of South Carolina" in 1831, in which he elaborated his views of the nature of the Union as given in the "Exposition." In 1832 a new tariff act was passed, which removed the "abominations" of 1828 but left the principle of protection intact. The people of South Carolina were not satisfied, and Calhoun in a third political tract, in the form of a letter to Governor James Hamilton (1786-1857) of South Carolina, gave his doctrines their final form, but without altering the fundamental principles that have already been stated. In 1832 South Carolina, acting in substantial accordance with Calhoun's theories, "nullified" the tariff acts passed by Congress in 1828 and 1832. On the 28th of December 1832 Calhoun resigned as vice-president, and on the 4th of January 1833 took his seat in the Senate. President Jackson had, in a special message, taken strong ground against the action of South Carolina, and a bill was introduced to extend the jurisdiction of the courts of the United States and clothe the president with additional powers, with the avowed object of meeting the situation in South Carolina. Calhoun, in turn, introduced resolutions upholding the doctrine held by South Carolina, and it was in the debate on the first-named measure, termed the "Force Bill", and on these resolutions, that the first intellectual duel took place between Daniel Webster and Calhoun. Webster declared that the Federal government through the Supreme Court was the ultimate expounder and interpreter of its own powers, while Calhoun championed the rights of the individual state under a written contract which reserved to each state its sovereignty. The practical result of the conflict over the tariff was a compromise. Congress passed an act gradually reducing the duties to a revenue basis, and South Carolina repealed her nullification measures. As the result of the conflict, Calhoun was greatly strengthened in his position as the leader of his party in the South. 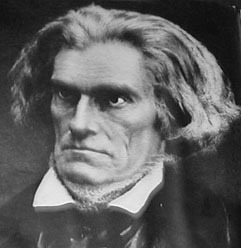 Southern leaders generally were now beginning to perceive, as Calhoun had already seen, that there was a permanent conflict between the North and the South, not only a divergence of interests between manufacturing and agricultural sections, but an inevitable struggle between free and slave labor. Should enough free states be admitted into the Union to destroy the balance of power, the North would naturally gain a preponderance in the Senate, as it had in the House, and might, within constitutional limits, legislate as it pleased. The Southern minority recognized, therefore, that they must henceforth direct the policy of the government in all questions affecting their peculiar interests, or their section would undergo a social and economic revolution. The Constitution, if strictly interpreted according to Calhoun's views, would secure this control to the minority, and prevent an industrial upheaval. An element of bitterness was now injected into the struggle. The Northern Abolitionists, to whom no contract or agreement was sacred that involved the continuance of slavery, regarded the clauses in the Federal Constitution which maintained the property rights of the slave-owners as treaties with evil, binding on no one, and bitterly attacked the slave-holders and the South generally. Their attacks may be said to have destroyed the moderate party in that section. Any criticism of their peculiar institution now came to be highly offensive to Southern leaders, and Calhoun, who always took the most advanced stand in behalf of Southern rights, urged (but in vain) that the Senate refuse to receive abolitionist petitions. He also advocated the exclusion of abolitionist literature from the mails. Indeed from 1832 until his death Calhoun may be said to have devoted his life to the protection of Southern interests. He became the exponent, the very embodiment, of an idea. It is a mistake, however, to characterize him as an enemy to the Union. His contention was that its preservation depended on the recognition of the rights guaranteed to the states by the Constitution, and that aggression by one section could only end in disruption. Secession, he contended, was the only final remedy left to the weaker. Calhoun was re-elected to the Senate in 1834 and in 1840, serving until 1843. From 1832 to 1837 he was a man without a party. He attacked the "spoils system" inaugurated by President Jackson, opposed the removal of the government deposits from the Bank of the United States, and in general was a severe critic of Jackson's administration. In this period he usually voted with the Whigs, but in 1837 he went over to the Democrats and supported the "independent treasury" scheme of President Martin Van Buren. He was spoken of for the presidency in 1844, but declined to become a candidate, and was appointed as secretary of state in the cabinet of President John Tyler, serving from the 1st of April 1844, throughout the remainder of the term, until the 10th of March 1845. While holding this office he devoted his energies chiefly to the acquisition of Texas, in order to preserve the equilibrium between the South and the constantly growing North. One of his last acts as secretary of state was to send a dispatch, on the 3rd of March 1845, inviting Texas to accept the terms proposed by Congress. Calhoun was once more elected to the Senate in 1845. The period of his subsequent service covered the settlement of the Oregon dispute with Great Britain and the Mexican War. On the 19th of February 1847 he introduced in the Senate a series of resolutions concerning the territory about to be acquired from Mexico, which marked the most advanced stand as yet taken by the pro-slavery party. The purport of these resolutions was to deny to Congress the power to prohibit slavery in the territories and to declare all previous enactments to this effect unconstitutional. In 1850 the Union seemed in imminent danger of dissolution. California was applying for admission to the Union as a state under a constitution which did not permit slavery. Her admission with two Senators would have placed the slave-holding states in the minority. In the midst of the debate on this application Calhoun died, on the 31st of March 1850, in Washington. Calhoun is most often compared with Webster and Clay. The three constitute the trio upon whom the attention of students at this period naturally rests. Calhoun possessed neither Webster's brilliant rhetoric nor his easy versatility, but he surpassed him in he ordered method and logical sequence of his mind. He never equaled Clay in the latter's magnetism of impulse and inspiration of affection, but he far surpassed him in clearness and directness and in tenacity of will. He surpassed them both in the distinctness with which he saw results, and in the boldness with which he formulated and followed his conclusions. Calhoun in person was tall and slender, and in his later years was emaciated. His features were angular and somewhat harsh, but with a striking face and very fine eyes of a brilliant dark blue. To his slaves he was just and kind. He lived the modest, unassuming life of a country planter when at his home, and at Washington lived as unostentatiously as possible, consistent with his public duties and position. His character in other respects was always of stainless integrity.